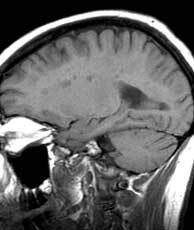 Findings: Scattered foci (a) of decreased signal in the deep white matter of both cerebral hemispheres. 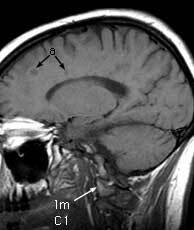 The corpus callosum (cc) is atrophic with foci of decreased attenuation involving the inferior aspect. 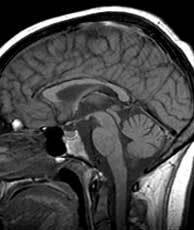 Scattered foci of decreased signal (b) are also present involving the brainstem. Left hippocampal formation (hip). Pineal gland (pin). Quadrigeminal plate (quad) overlying the Sylvian aqueduct. Fourth ventricle (4v). Anterior arch of C1 (aa C1). Posterior arch of C1 (pa C1). Right lateral mass of C1 (lm C1).